Sarah has a personal philosophy of “traveling bigger.” With her insatiable passion for travel, Sarah has made it her life’s mission to take travelers to the limits of their comfort zone, while making sure every detail is taken care of through thoughtful and thorough travel planning. What results is a magical trip complete with personal growth and memories that will never fade. Sarah delights in crafting once-in-a-lifetime experiences, and helping her clients develop a big picture to conquer their travel bucket-lists. Sarah dives into the planning process by having an in-depth discussion with each of her clients to discover their individual travel style and taste. Armed with her extensive travel experience, strong industry relationships, and knowledge of her client; she handles all of the behind the scenes logistics while adding a little “wow” to curate one-of-kind itineraries that clients won’t soon forget. 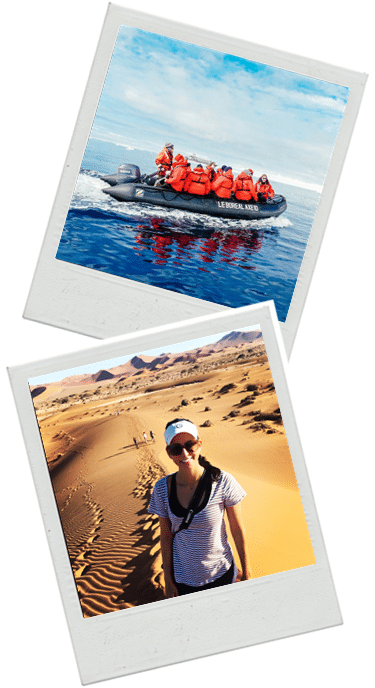 Twenty years, seven continents and ninety countries later, Sarah’s travel experiences range from ultra-luxury safaris, nomadic homestays, language immersion, to luxury-chartered sailing with travel styles varying from highly detailed itineraries to on-the-fly backpacking excursions. Sarah has an MBA from Stanford Graduate School of Business and a BBA in Finance from The University of Texas Austin. She has held many interesting positions in investing and start-ups, ensuring your trip will be treated with the utmost professionalism that she has shown throughout her career.